Completed frittata, with plain yogurt and some fresh thyme. It’s what I had. A couple weeks ago, I signed up for my very first CSA share from North Pulaski Farms, a local, organic small farm. CSA means community supported agriculture, where you basically buy a share of the farm for a season. They can plan better and have a predictable flow of sales, and I get fresh veggies. You see where I’m going with this. Things went well with the first box. I made sauce out of the raspberries, used the eggplant for a cooking demo, roasted the grape tomatoes for risotto, and worked the bell peppers into several things. This past week, though, was super busy. I pick up the CSA box on Sunday from the Bernice Garden Farmers’ Market. Today is Thursday. This morning, the tomatoes, okra, bell peppers (both fresh and smoked) and eggplant stared up at me from the veggie bins. There were also a ton of other leftovers and things needing to be used. Ugh. After finishing up some critical biz-ness, I scrapped the rest of my to-do list and set up shop in the kitchen. Operation Fridge Cleanout, commence. First, I was STARVING, so I made a frittata for lunch. I preheated the oven to 375 degrees. I seared some of the grape tomatoes in a super-hot, smallish cast iron skillet, no oil. I added some leftover fried potatoes that were in the fridge. I tore up some fresh parsley and basil that I had leftover. Added them to the hot skillet. Winning: No knives needed so far. Salt and pepper on top. I whisked 5 eggs (mine were small) and poured them over the mixture. Parmesan on top of that. Threw it in the oven. Waited. Ate. What was I busy doing, you ask? I was chopping up a crap-ton of other veggies for a GF veggie lasagna I put in the slow cooker. I was soooo excited about it. This is gonna be great on the blog, I said. Eggplant! Bell peppers! Smoked peppers! Mushrooms! It. Will. Be. GLORIOUS. It may have been good a couple hours before we ate it, but let’s just say even the very freshest veggies and the best GF lasagna pasta get mushy when overcooked. After cooking all afternoon and through piano lessons, soccer and a Boy Scout meeting…Slow cooker fail. Oh well. 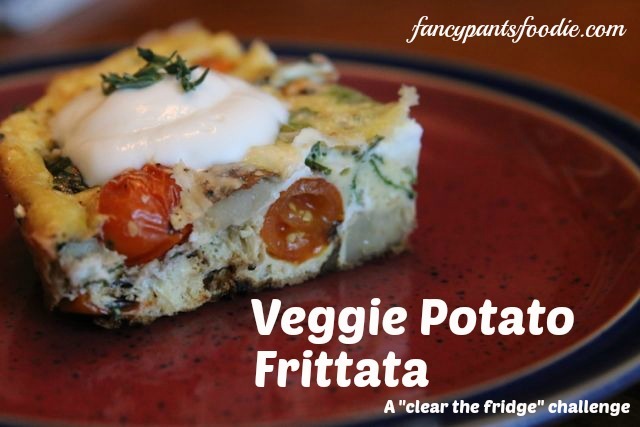 At least I have frittata leftovers for tomorrow’s breakfast! The idea is born partly from being frugal and partly from respecting our resources, looking down on waste. This has been important to me lately, especially after traveling overseas. We throw away more food daily than some people see all week. To participate, you can be really formal and organized about it, or (like me) not. No guilt either way. Just become more aware of what you are buying and cooking, what is being used and what is being wasted. The organized version, I do plan to accomplish sooner or later. It entails making a thorough inventory of your freezer, fridge and pantry (a great opportunity to throw out funky stuff, too). Then create meal plans, about a week at a time, using those things. If you’re really into a challenge, commit to using just those things. My own going-to-school-again-plus-too-much-other-stuff version: Take a quick visual inventory of said freezer, fridge and pantry and do the same, just a day or two at a time. This has become my own free therapy program…I’m addicted to grocery shopping. I love it. I’d rather fill up a Kroger or Whole Foods grocery cart any day over shoe shopping. Just me. This process has made me so very thankful for what we already have in our home. In fact, the phrase “embarrassment of riches” keeps coming to mind. Enough sniveling! Here’s what I made last night from freezer, fridge and pantry: An Asian/Italian fusion dish. Sortof. 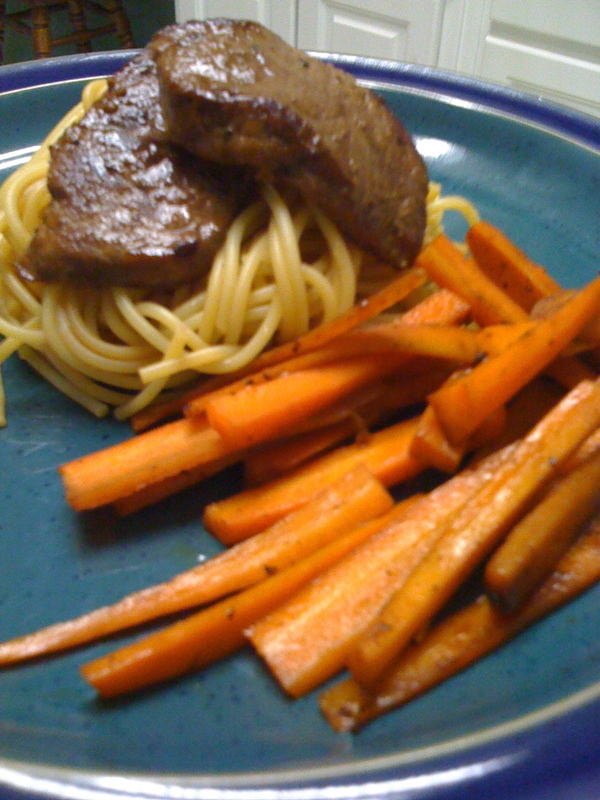 I should have sprinkled sesame seeds into the noodles and carrots after they were done, but I forgot. So here's the "really finished but not quite as well lit" photo. I had some deer tenderloin that a co-worker had given the hubs (yum). I also had a box of spaghetti (half-price damaged box at Kroger) that could stand in for Japanese udon noodles. I had some really great bulk carrots in the fridge. And I’ve got gobs of vinegars, oils and seasonings. So. I marinated the deer in olive oil and balsamic vinegar and some Italian herbs. About an hour before dinner, I sliced the carrots into batons and sprinkled on a bit of olive oil and apple cider vinegar for a quick marinade. Then, as I boiled the noodles, I seared the meat in a very hot pan. When the meat was at medium (deer can get chewy any further than that), I took it out and held it on a plate. The noodles came out about then, which I drained into a colander that I left in the sink. I deglazed the pan with soy sauce (well, actually Bragg’s Liquid Aminos, but either works) and poured over the hot noodles, which soaked it up gladly. I tossed in some sesame oil, a bit more soy and some green onion slices. And to really confuse the palate as to which continent it was visiting, I tossed in about a half cup of freshly grated parmesan cheese. I honestly wasn’t expecting this to be all that great (kind of a make-do dinner), but it was really quite tasty! And, miracle of miracles, EVERYONE in the family ate it. Even the 2-year-old, who has been on a hunger strike if it isn’t a hot dog or chicken nugget. I’d probably marinate the meat longer next time just because deer is kinda tough, but beef would be fabulous this way. Why don’t you give the Eat from the Pantry Challenge a whirl? Even if it’s just for one meal, I’d love to hear what you find and create with it.